As a speaker, I get to pass out some discount codes for Interop. 25% off the site cost for the 5, 3 or 2 day passes so nothing to sneeze at in terms of savings. 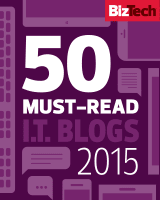 Many thanks to the Interop folks for doing that. No restriction on the discount code best I know (so pass it out to friends and colleagues) except it has to be used by Friday, April 29th. This year at Interop I will be presenting on "Advanced IPv6 Design and Deployment in a Microsoft Enterprise Network" and the focus is really about what does and doesn't work. 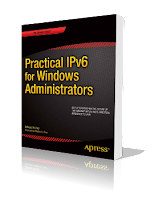 It is a practical, in person, update of Chapter 3 of my book Practical IPv6 for Windows Administrators from Apress. 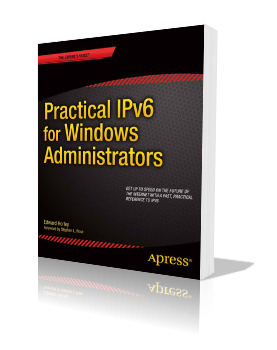 The goal is to pass along some of the lessons learned and updates on some IPv6 behavior, specifically around the Microsoft Windows OS. Last year I did a full 3 hour IPv6 workshop on IPv6 that covered a wider range of IPv6 concerns. This year, I wanted to focus on IPv6 issues that would impact Enterprise, Commerical, and Small Businesses who run Microsoft Windows in their environment. We can detour a bit talking about Virtualization (VMware and Hyper-V) depending on what the audience wants to cover. I'm really looking forward to seeing many friends, colleagues and fellow speakers in Las Vegas next month for Interop and I encourage you to join me. 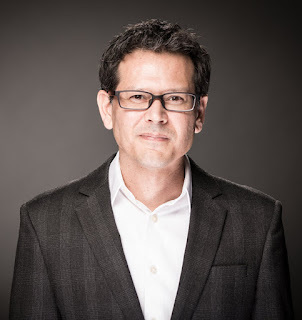 I consider Interop to be one of the shining stars of independent conferences that gets great content, excellent independent speakers and really has an impact on the industry and value for the attendees. If you are attending, please let me know via twitter, perhaps we can meet in person at some point during the event. Finally, if you attend my session you have a chance to win a signed copy of my book. I will give out two copies after my session is over. I encourage you to also attend some of the other IPv6 content that will be presented at Interop. Hope to see you there!